I’m glad to report that this race was far better than last year. The kinks were worked out and the course was the right length. Jimmy the Greek’s had a nice crowd inside before the race, and there were bunches of fliers for other events. Pre-registration was $16 (or $20 on race day), and picking up my number was a breeze. 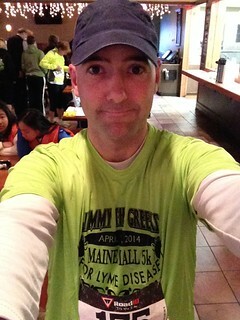 Since I was in the first 250 registrants, I got a t-shirt, which I put on right away. Here’s my new race shirt. My number was 175. I was a bit early, so I wound up waiting for a good while. Parking was easy since the race just takes us around the Maine Mall, so I took my other shirt and wallet and things back to the car. The organizers weren’t shy about last year. During the pre-race briefing, the bullhorn guy said “Have a great race, and we’ll see you all in fifteen minutes.” Most of us got a pretty good laugh out of that one. I won’t bore you with a play-by-play of the race itself, but here are a couple of highlights. First, the course was properly executed with proper police coverage of the intersections and plenty of volunteers to guide the runners. Second, I heard plenty of folks joking with the volunteers about whether we were running in the right direction. So as it turns out, this story has a very happy ending. They had some trouble last year, but it wasn’t really their fault that the lead car goofed up, and they can’t force the police to assemble on time. They were sensitive about how things went, though. I got a feeling from the event that things had been planned out very carefully to avoid any snags. Reputation is very important for a race that’s only three years old.